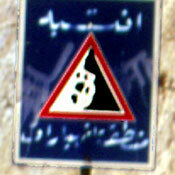 Jordan comes as a real challenge to the road-sign collector. 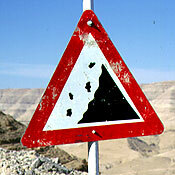 Even as it is a small country you would arrive nowhere if you called for a stop for yet another falling rock sign that pops-up before the windshield. You would probably end up next to one of the study objects staring at the bus disappearing below the horizon. I thus leaned out of the window and put my faith in my camera's autofocus. And in the second team that cruised Jordan at the same time. Busy point-and-clicking I suffered of an eerie feeling. 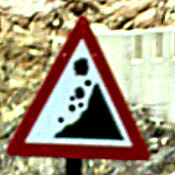 It wasn't like being at home (see Men at work); it was more like a déja-vu. But I couldn't put my finger on it. 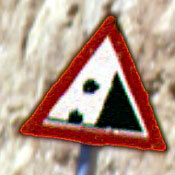 It was only much later that it jumped to my mind: this was a replay of an earlier expedition in South-Africa ! 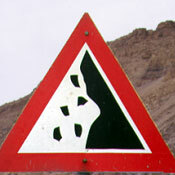 All Falling Rock signs on the Desert Highway are identical and of the South-African kind. 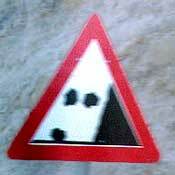 Inexperienced readers may think of the UK-breed, but a quick look-up will reveal the differences in the numbers and position of the boulders. 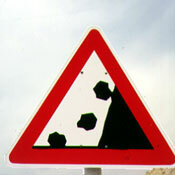 A UK-sign counts three pebbles, one big stone, then again three small ones and ends with one huge boulder. All finds of this panel were mounted on their sides. 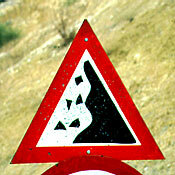 I've explained a probable reason in the text about Armenia. 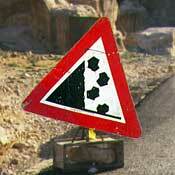 Many of the other rock-signs are also inspired by South-Africa, I think. 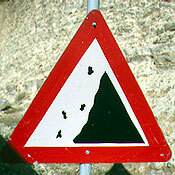 Though the number of stones has dropped from seven to five. Enjoy the diversity. 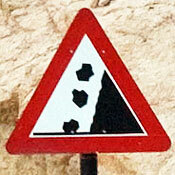 It's particularly refreshing to look at the behaviour of the cliff. It starts as a straight wall and at the end develops waves like a sea under Beaufort 12. 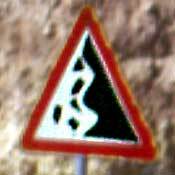 The next few rows show another family of Jordanian rock-signs. 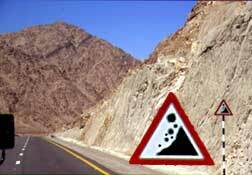 They are characterised by a small number of huge stones of which one already hit the ground. 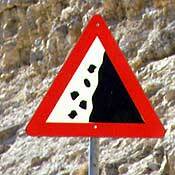 This is a rather uncommon feature in Falling Rock signs. More important however is that this collection sheds a light on their making. Look carefully, then read on. We have six different designs but the stones come in two shapes only (see detail ¥). 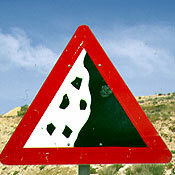 There's agreement about which kind of boulder is at the bottom, but no recipe for the rest. The assembler may grab in the box of his liking and position the rocks to his taste. One of each shape is recommended, but if he fancies four of a kind, so be it. Artist's freedom. 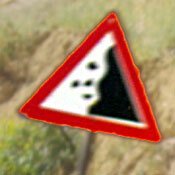 ¥ Detail of the two kinds of building blocks available for falling rock signs. † This configuration is also found in Sweden. 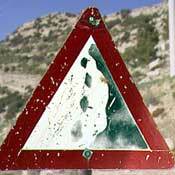 ‡ The Amman sign with not more than two stones is very peculiar. 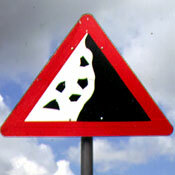 Similar warning signs were only found in Belgium (Liège) and Scotland. 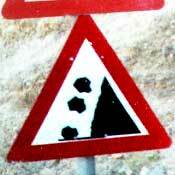 We end with a batch of warning signs featuring four rather small boulders. I have no similar finds from other countries. They are probably local produce.